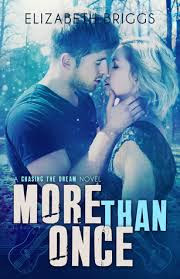 This is my second time reading a book by Elizabeth Briggs in the Chasing the Dream series and I enjoyed this book as much as the I did the previous book. I loved Andrew's character because he was the perfect combination on a good and bad boy, but it did annoy me when he kept on giving Becca mixed signals. Becca's character was of a bad girl who was trying to put her life right and I really enjoyed the fact that she learnt from her mistakes and was not afraid to admit them. The chemistry between Becca and Andrew was was steaming hot and I loved the both sides to them. Elizabeth's writing was flawless and I loved her characters and dual point of view style of writing. The only thing I wished there was more of was drama and some stronger emotions. Overall this was a great novel filled with lovable characters and I am definitely going to read the rest of the series. Andrew West is done being the nice guy, after a rejected proposal he starts over in a new city and vows to never risk his heart again. Becca Collins is done being the bad girl and after quitting her band she decided to show her parents that she has really changed. When she is dumped by her boyfriend on Christmas Eve she is lost and that is when she runs into an old one night stand - Andrew. In order to impress her parents Becca convinces Andrew to be her perfect fake boyfriend for her family holiday dinner. Andrew show Becca that he can be a bad boy in the bedroom, and after that neither of them wants to pretend anymore. When Becca is offered to join her band again and Andrew comes face to face with his ex, they both wonder if they are ready to take the leap of faith again or are they doomed to fail in love and life again.